Like its onshore equivalent, topsides processing and handling on the production platform prepares extracted hydrocarbons for transport. Yokogawa provides integrated control and monitoring solutions that maximize the productivity and availability of topsides operations. Seamless integration between the topsides system and the subsea master control system (MCS) is getting to be a common demand from offshore field operators. Throughout various projects, Yokogawa has been standardizing functional templates to run the full MCS functionality into a distributed control system. This advanced and reliable architecture add rapid progress and flexibility to your subsea automation strategy. Offshore projects can sometimes be financially unqualifiable unless innovative techniques are used to reduce CAPEX and OPEX costs. One such method invovles the use of a High Integrity Pressure Protection System (HIPPS) located on the seabed, which would allow de-rating of the flow lines. Traditionally, the flow lines are designed to withstand the maximum wellhead pressure, with HIPPS systems located topsides to protect the process. In this instance, it was realized that major capital savings could be made on the flow lines if the HIPPs could be relocated closer to the wellheads. The concept required technology which could combine the highest integrity with the highest reliability and availability. Yokogawa has a great deal of experience in the supply of High Integrity Pressure Protection Systems (HIPPS) using the Magnetic Logic based ProSafe-SLS system, certified for applications up to SIL4. Many topsides HIPPS systems have been delivered which provide the same SIL level and basic functionality but do not have the same constraints on power and weight. The Mars B Project added the following greenfield infrastructure to boost production at the Mars field and nearby exploration discoveries: the Olympus tension leg platform (TLP), which has 24 well slots and a self-contained drilling rig; the West Boreas/South Deimos subsea system; and an oil and gas export system, which includes the WD-143C shallow-water platform. The Olympus tension leg platform (TLP) started producing on February 4, 2014. The TLP is the second at the Mars field and the sixth of its type for Shell in the Gulf of Mexico. The paperless recorder DX series instruments allow you to determine temperature and humidity, and manage the results as manufacturing and quality data at a reasonable cost with a simple configuration. The distance is not so long, but there are many pipes and tanks ("Pipe Jungle") in the field. Had to avoid the obstacles and take care multi path condition. Repeater is installed on high place between control room and monitor position. The extend cable is used for antenna of Gateway. ISA100 wireless temperature and pressure transmitters. Gas flow data calculated by an RTU can be sent back to a transmitter using the two-way communications capability of FOUNDATION fieldbus. Yokogawa provides controller embedded flow calculation library based on AGA (American Gas Association) reports. Measuring energy consumption is an important factor in the quest to improve energy efficiency. Efficient and accurate metering is paramount to determining excess use, along with an accurate picture of where the steam is being used. The more accurate and reliable measurements that are made, the more informed decisions can be taken that affect costs and product quality. Traditionally the most common method of steam metering is the orifice plate and differential pressure transmitter technique. General areas of concern with this type of measurement are the orifice plate's susceptibility to wear introducing immediate inaccuracies, the relatively high permanent pressure losses introduced into the system by the orifice place and the small measuring range, typically 3:1. Yokogawa's digitalYEWFLO Reduced Bore Type Vortex Flow meter features a cast stainless steel body and a concentric reducer and expander that enable stable flow rate measurements in low-flow conditions. This expands the range of measurements that can be performed, from the higher flow rates down to the lower end of the flow span, which is normally difficult for Vortex Flow meters, and ensures stable and accurate flow rate output. Flow Measurement of diesel fuel is a relatively basic flow meter application. However, measuring net fuel consumption on a 2.2 megawatt diesel generator is uniquely complex. The diesel engine requires a supply fuel line (fuel from the tank to the engine) and a return fuel line (fuel from the engine back to the tank). Yokogawa first introduced its renowned SUPER CONTROL™ in industrial controllers over a decade ago. This is a fuzzy logic alogrithm that eliminates overshoot from the desired set point and mimics the control expertise of the most experienced operator. There are numerous industrial applications where measurements and/or control of a specific chemical strength of the process is critical for optimizing the production of the end product. These specific concentrations are obtained by mixing a full strength solution with water to achieve the desired percent concentration. It is estimated that almost two thirds of oil discovered in the United States lies unrecovered trapped in porous formations. There are approximately 500,000 abandoned wells containing such oil. Because of this fact oil companies are constantly pursuing methods for the recovery of this oil. Both centrifigal and axial compressors cannot be allowed to operate below the surge limit of the operating conditions. The machinery may be exposed to excessive stress and vibration. If the discharge flow demand is less than the compressor surge limit, some of that flow must be vented or recycled to the inlet to stay above surge. PID is an acronym for proportional band, integral and derivative. This control action allows a measurement (process variable) to be controlled at a desired set point by continuously adjusting a control output. These control parameters act on the error or deviation between set point and process variable. Tuning PID controllers can seem a mystery. Parameters that provide effective control over a process one day fail to do so the next. The stability and responsiveness of a process seem to be at complete odds with each other. And controller equations include subtle differences that can baffle even the most experienced practitioners. This white paper provides an overview of how Yokogawa believes its customers can best prepare for and position themselves to benefit from IIoT-enabled technology and solutions and digitalization in general to emerge as the successful connected industrial enterprises of the future. Yokogawa’s industrial automation (IA) product and service offerings, industry domain knowledge, and VigilantPlant approach – which emphasizes safe, secure, and uninterrupted operations -- provide a solid foundation for an Industrial Internet of Things that specifically addresses the requirements of process automation, particularly for the OT side of the equation. To be able to provide an equally solid foundation for the IT side, Yokogawa is partnering with Cisco Systems and other industry leaders. Recently, there is an increasing demand for operation and monitoring of all the various controllers distributed in the field on the same screens to improve plant operation efficiency. The purpose of the Unified Gateway Station (UGS) is to connect external controllers, such as the STARDOM's FCN/FCJ autonomous controllers and other vendors' controllers, to the CENTUM VP integrated production control system and to operate and monitor those external controllers on the Human Interface Station (HIS) screens, the operation and monitoring screens for the CENTUM VP. Vortex flow meters utilize a fluid phenomenon in which frequencies of Karman vortex streets released from a shedder bar inserted in a flow are proportional to flow velocities. One solution packaged for production control systems today is a system comprising a PLC and SCADA (Supervisory Control and Data Acquisition) software that runs on a PC. An advantage of these systems is that they can be configured at considerably lower cost than systems that use dedicated devices as they use commercially available PCs. As international price competition becomes increasingly fierce, high value-added, high-efficiency production is essential for the survival of production plants in the oil refining, chemical and other industries. On the other hand, if plant equipment, which is the foundation of these production industries fails, business opportunities will be lost due to loss of yield, environmental destruction, and weakened financial strength due to social compensation. Wireless technology has a long history, and it began around the time that James C. Maxwell theoretically predicted and then proved the existence of electromagnetic waves in the 1860s, and when Heinrich R. Hertz experimentally confirmed the actual existence of the electromagnetic wave in 1888. When a project is executed following the main automation contractor (MAC) method, front-end engineering and design (FEED) is conducted before actual delivery phases such as design, implementation, inspection, and shipment, to identify risks in advance and mitigate risks in delivery phases through the standardization of the basic functions and components. Field instruments are expected to be equipped with diagnostic functions to predict abnormal process conditions, and are also expected to expand these functions. The ability to extract diagnostic information for prediction and prevention from various physical process quantities measured by devices and make it available allows the user to reduce non-essential and non-urgent maintenance and thus cut maintenance costs. Yokogawa Electric Corporation promotes the standardization of FOUNDATION™ fieldbus as the communication foundation supporting Asset Excellence for VigilantPlant, which is an approach aimed at the advancement of plant instruments and equipment. With the recent dramatic advancement of fieldbus technologies, information processing technologies, and network speed, it has become possible to process various kinds of information inside the field sensors and transmit the results to the distributed control system (DCS) and host computer. Large process industry companies have recently started building plants with world-class safety and profitability to reinforce their competitive edge in the global market. As for plant operations, support functions for improving operators' plant operation skills and for extending operators' maximum capability are required to the DCS so that an operator can expand the area of plant monitoring or operate a plant with higher cost- consciousness. In 2000, we formed a technical tie-up with Shell Global Solutions (SGSI) to enter the advanced process control and optimization solution business. At the same time, we started marketing a solution based package comprising an Exasmoc multi-variable model-based predictive control function, an Exarqe property estimation function, an Exaspot online real-time optimizer and an MD control monitor & diagnosis function by taking full advantage of the SGSI advanced control and optimization technology (APC&O). There is growing recognition of the importance of preventing serious accidents in the process control field in view of the potential scale of impact on society. The IEC 61508 and IEC 61511 international standards call for the reduction of risk using safety instrumented systems (SIS) as well as the configuration of multiple protective layers in a process control system in order to prevent major accidents. As plant operation becomes more intelligent and complex, the alarm system for safe and stable operation is becoming increasingly important. An alarm warns operators of an abnormal situation in a process and urges them to respond to it. In plant sites, there are various places such as those affording an unobstructed view like tank yards, and others surrounded by metal pipes and equipment obstructing the view (hereafter referred to "pipe jungles"), often seen in oil refinery and chemical on-site plants. The frequency band of radio waves used for field wireless communication is 2.4 GHz, which has high straightness and its ability to go around things can hardly be expected. The engineering phase holds the largest ratios in control system configuration in terms of both time and money, so improving engineering efficiency is one of the biggest issues when it comes to system integration. In the STARDOM, Application Portfolios (APPF) are devised to dramatically slash engineering costs and increase software reliability. In 2005, Yokogawa announced "VigilantPlant" as a concept to ward the realization of a type of plant operation that is considered ideal by our customers. As industrial plant systems have increased in scale and their automatic control algorithms advanced, today's operators are required to have more advanced skills and knowledge of theplant systems and to learn the actions to be taken in response to any possible situations including emergencies. As the world's societies become more connected, market competition is becoming more ruthless and transactions are performed at ever increasing speeds. Deregulation has ignited global competition throughout the world. The proliferation of Information and Internet technologies have accelerated the growth of global competition, with life cycles for high tech products having lives measured in "dog years" (in each normal year they advance seven years). When considering improving the efficiency of plant operation, major focus is put on process units, control systems and production or operation management. However, it is also important to prepare a comfortable and safe environment for operators, who are trying to operate the plant more efficiently every day using control systems. As a founding member of the Fieldbus Foundation and one of the companies on the board, Yokogawa Electric Corporation has contributed to the development of fieldbus specifications from the outset. Yokogawa Electric has lead the foundation by proposing the technical base for interoperability among other things. The manufacturing industry has grown based on solid production technologies for creating quality products. However, the economic environment is changing dramatically, forcing manufacturing firms to face tough global competition; firms must ship the right products at the right time as the market requests. Differential pressure transmitters, which serve as the core of field instrumentation, are widely used to measure the flow rate, pressure and density of liquids, gases and steam, as well as the level of liquid in a tank. Safe plant operation has long been pursued in all industries. Specifically, in the process automation industry which involves many hazardous elements, safety measures including explosion-protected systems have been adopted based on numerous tragic experiences. When evaluating mass flow rates using a primary device such as an orifice or nozzle in a differential pressure flow meter in order to make fluid density compensations, the upstream pressure (static pressure) and fluid temperature are measured in addition to the output of a regular differential pressure transmitter. Improved plant operation efficiency and reduced maintenance costs based on appropriate predictive maintenance are the common objectives that need to be achieved in every manufacturing domain. Exaquantum is positioned above the Process Control System (PCS) layer and gathers and stores huge volumes of process and laboratory data over long terms. Intelligent field instruments and process analyzers accumulate diverse field information including process values and diagnostic results. This data needs to be sent to upper systems such as distributed control systems (DCS) via digital communications such as FOUNDATION Fieldbus and analyzer buses, or hybrid communications such as HART and Brain, and visualized to enable the customer to utilize them for plant operations and maintenance. Many field devices are now being connected to process control systems through fieldbus communication. These field devices have intelligence, and so many settings and adjustments can be made through fieldbus communication. As for a controller used in a distributed control system (DCS) shown in Figure 1, covering as many applications as possible with a single controller will bring cost reduction effects such as easy engineering and a small controller installation area. Therefore, the controller is required to process large amounts of data more quickly. More than ten years have passed since the first digitized field devices were introduced. These support either a hybrid communication protocol such as HART or a full digital communication protocol such as FOUNDATION Fieldbus. The specifications of the ISA100.11a wireless communication standard of the International Society of Automation (ISA) for industrial automation were published, and companies are developing products based on the standard. The ISA100.11a has many features such as high reliability including redundancy, network scalability, and support for various protocols for industrial automation. There are already safety systems on the market that have achieved safety integrity level SIL3 of the functional safety standard, IEC61508. However, most of them have achieved SIL3 by conversion of modules into dual-redundant or triplex form. The recent variety of industrial and railway accidents happening right before our very eyes make us painfully aware that "safety" must be put first and foremost. "Safety first" is a concept accepted by everyone and there is no room for disagreement. However, the author feels that, in some cases, the concrete objectives of "safety first" are not actually clear, and the grasp of the hazards is insufficient. In recent years, safety and profitability have become ever more important in the process industry due to fierce global competition. Greater emphasis is being placed on highly efficient plant operation for reducing the increasing energy bill. The business world surrounding the manufacturing industry is undergoing rapid and drastic changes. Achieving production activities that can respond swiftly to such environmental changes has become an urgent task. As field instrumentation devices become increasingly digitized and computerized, interactive and remote access to a large quantity of field information becomes possible. This will increase the efficiency of plant equipment maintenance by reducing labor requirements in field patrol work for example. In recent years it has become increasingly common for plants to be provided not only with the control layer of a production control system (DCS, etc. ), but also with the protection layer of a safety instrumented system (SIS) to reduce the risk of industrial accidents. The safety instrumented system is indispensable for avoiding risks to a plant failure. Instrumentation devices and equipment serve for plants as the eyes, ears, nose, tongue, and skin, which are responsible for the five senses, and act as the central nervous system and brain do for human beings. The reliability and availability of such devices and equipment are the most important requirements of customers. Vortex flow meters have been appreciated by users as volume flow meters, which can, in principle, be applied to any flow measurement of liquid, gas, or steam. Volume flow measurement is enough for substances with small variations in density such as liquid. In 1988, Yokogawa launched the ADMAG series of magnetic flow meters with increased resistance to fluid noise and zero stability, employing dual frequency excitation which was developed based on its long-cultivated technology for flow measurement. Since then, the ADMAG family has augmented its application range with such models as explosion-proof and integral types, and a capacitance type. Since the release of the DPharp EJ series in 1991 and the DPharp EJA series in 1994, nearly 1.2 million of these transmitters have been operating all over the world. Recently, we have also developed the EJX series of even more compact, lightweight and advanced transmitters with multi- sensing capabilities built using silicon resonant sensor technology. 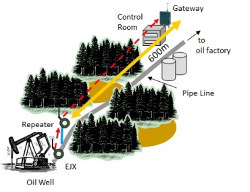 The introduction of wireless technologies into plants is anticipated as one of the measures for implementing field digital solutions not only to reduce cable wiring costs but also to improve plant wide safety/stable operations, operating efficiency, and so on. Yokogawa proposed the VigilantPlant concept as an ideal plant that achieves fully optimized operation where all the necessary information is given to all the operators involved in the plant operation. In VigilantPlant, operators are able to quickly respond to changes in the external environment while the production activities run without any interruption. Recently, standardization of procedural automation of manual operations has been promoted mainly by the International Society of Automation (ISA), and the functional requirements necessary for automation are being studied by the ISA106 committee in the US. Upgrading and renewal of plant facilities, including production control systems and safety instrumented systems, are essential for maintaining safe and efficient plant operation. Even though these activities are categorized as R&R, they require investment and customers are often required to evaluate the profitability for obtaining approval. A dynamic simulator is a software tool for building a virtual plant in a computer by modeling an existing plant or a plant to be built. 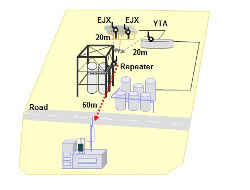 The introduction of wireless into industrial monitoring and control not only reduces wiring and maintenance costs but also expands its applications to include those which are impossible with wired systems, such as monitoring points which have to be given up due to the difficulty of the construction, and monitoring of points on rotating or frequently moved objects. In recent years, more field wireless devices have been used in hazardous areas. Meanwhile, in plants that are usually recognized as hazardous areas, there are numerous metallic tanks and pipes that easily shield or reflect radio waves, as discussed later, thus resulting in a poor environment for wireless communication. Environment and safety are major topics on a global scale in recent times. As symbolized by the effectuation of the Kyoto Protocol, an interest in preserving the environment is growing worldwide, and there is also a tendency to criticize more severely, occurrences of industrial accidents that are accompanied by environmental contamination or which may cause damage, etc., to residents in the surrounding areas. Conventional safety instrumented system (SIS) is typically installed separated from a distributed control system (DCS) to eliminate interference from the DCS and assure safety. However, users increasingly wish to integrate SIS with DCS while maintaining the safety of safety controllers. In recent years, expectations for control systems using wireless communications have been increasing in the process control market. This is because these systems do not require power and communication wiring for field instruments, enabling reduced initial and maintenance costs, and easy installation. Yokogawa has been leading the process automation industries as one of the pioneers in field digital technologies represented by the FOUNDATION fieldbus™ and Field Device Tool/Device Type Manager (FDT/DTM).